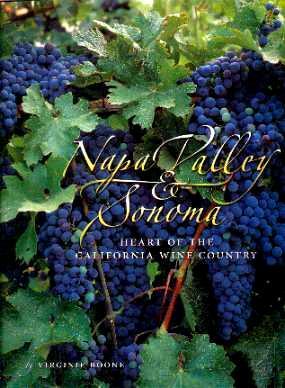 Another title in the Visual Tour series is this Napa Valley & Sonoma book. Full of the most enticing photographs depicting the fertile land with greenery everywhere. This part of the world has long been attracting visitors to the wineries, and sights, and even more so now with the many different types of grapes grown here. This book offers maps of the various wine regions, informative details of the wine-making process, the history of the area, sights to see, and more. It's interesting to learn how the area got started and how people even today come to the Napa Valley to grow grapes and make their own wine. Wonderful communities have thrived and continue to thrive as this area attracts not only tourists from around the world, but also vintners and anyone else interested in the wine business. The climate is favorable and generally mild - a good place to live. Also featured in this book are the "culinary delights" - food and wine go together and it would be remiss not to include this obvious aspect to the winelands. Because of the great climate and abundance of land for grazing and growing vegetables, they have the best of the best. Worth investigating. Conclusion - Another superb collector's item in this series. Very interesting and alluring.